The woven-wire poultry fencing is an unusually difficult thing to handle and fasten on posts so that it will be taut and evenly stretched. 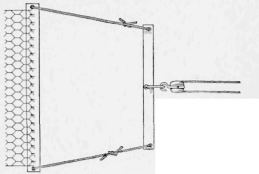 The best method I have ever seen for drawing this fencing and holding it for nailing to a post is the use of the device shown in the sketch. It consists of a board, as long as the fencing is wide, with screw hooks set far enough apart to catch into the meshes of the wire, and a crosspiece attached to the board by pieces of rope at the ends and provided with a pulling loop in the center. - Contributed by Joseph C. Laackman, Meadow Brook, Pa.